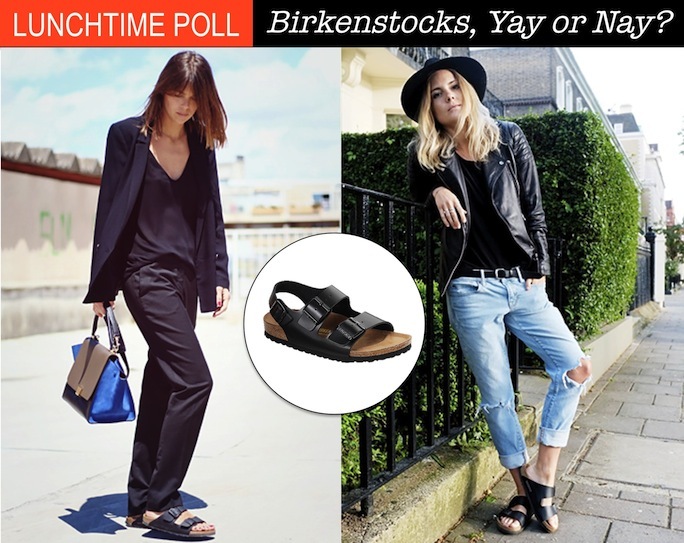 A Bit of Sass: Lunchtime Poll: Birkenstocks, Yay or Nay? Lunchtime Poll: Birkenstocks, Yay or Nay? If an Olsen twin wears them, they're "in", right? Well if that's the case, Ashley Olsen has reinvigorated Birkenstocks, favoring this black patent sandal. Her affair with the grunge era staple can probably be attributed to designers Phoebe Philo of Celine and Giambattista Valli, who both included takes on Birkenstocks in their S/S 13 runway shows. I have to say, the laid back "I don't give a sh*t" attitude of a classic pair of Birkenstocks mixed with trend worthy separates is my kinda cool. And the Arizona in white may have to come on my next island getaway with me. Let me hear your thoughts. Are Birkenstocks fashionably in, or a fashion sin? Nay but they look so comfy ! Absolute nay! I know they're comfy but no...just no! I love them in both looks. Not something I would think to buy but I really love them in the second look. yay, I kinda want a pair! I think they are great if you wear them the right way! Thanks for commenting on my blog. Would you like to follow each other? I say Nay! They seem really comfy though...I just cannot do it! Nay I think. They look too much like something I would buy at the pharmacy to be fashion. But I hear they're comfy so who can blame a gal for wanting to try them out.